The Sony Xperia T comes with a GPS receiver, which took about a minute to get satellite lock upon a cold start. You can use the A-GPS functionality to get near instantaneous locks. Alternatively, network positioning will also do if you only need an estimate of your location. Google Maps is a standard part of the Android package and we've covered it many times before. It offers voice-guided navigation in certain countries and falls back to a list of instructions elsewhere. Google Maps uses vector maps, which are very data efficient. The latest version has an easy to use interface for caching maps - you just choose "Make available offline" from the menu and pan/zoom around until the desired area is in view (there's an indicator showing how much storage caching that area will take). You can later view cached areas and delete ones you no longer need. Note that there's a limit to the size of the area you can cache - you can't just make all of Europe available offline, not even a whole country. We managed to cache London and some surrounding regions before Maps told us the area is too big. Also, there's no address search in the cached maps and you can only cache map data in supported regions of the world. You can also plan routes, search for nearby POI and go into the always cool Street View. The app will reroute you if you get off course, even without a data connection. Wisepilot is also part of the Sony Xperia T package, with a navigation license for 30-days and downloadable maps for offline navigation. You need to pay extra to continue using the app once the trial has expired, though. 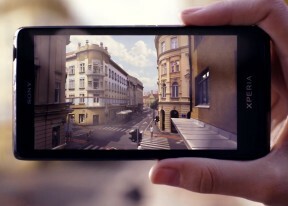 Running on Android ICS, the Xperia T has access to the latest apps and the ample built-in memory plus the available microSD slot guarantees you won't have trouble with space. The Store is organized in a few scrollable tabs - categories, featured, top paid, top free, top grossing, top new paid, top new free and trending. The in-app section is untouched though and it's very informative - a description, latest changes, number of downloads and comments with rating. There is usually a demo video and several screenshots for most apps too. Google recently announced ebooks now being available from Google Play. Play Books gives us the first official Android ebook reader app, and it's pretty impressive. Play Books comes with several book preloaded, which can be browsed in a 3D carousel view (by default). There's page transition animation similar to the one in the iOS reader, and you can adjust things like font style, size, and alignment, as well as background brightness and line height. You can also view the pages as they were originally formatted in the book, rather than optimized for viewing on a screen.